Deco Wood Floor Competition Winner meets his Frozen Umber - V4 Wood Flooring Ltd.
Our recent competition sparked a wave of inspired entries as we asked you to suggest a new name for the final wood in our new, contemporary Deco wood floor collection. 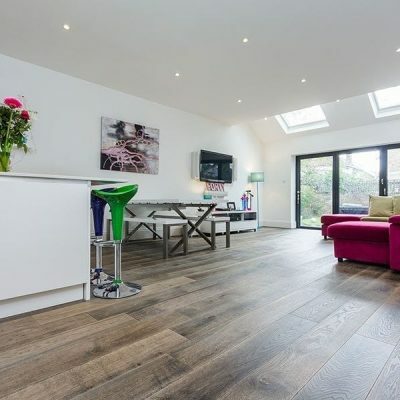 The ultra modern engineered wood flooring range consists of six modern colours and finishes, created with a combination of traditional colouring techniques to deliver soft, subtle tones. He visited his local V4 retailer, Floor De Lee this week to collect his £1000.00 prize voucher towards a new Deco wood floor. 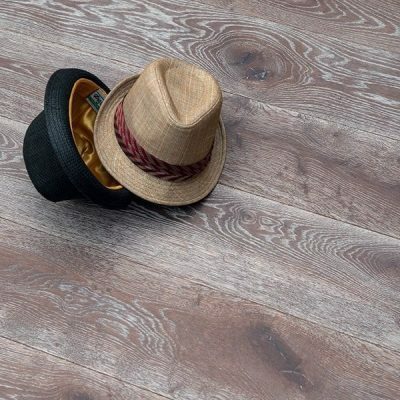 Frozen Umber, along with the other finishes in the full Deco collection, features a stylish finish, produced from a 6mm top layer of real oak, which is lightly brushed to release its natural grain. A coat of wood lye is then hand applied to lighten and softly bleach the oak surface. The result is a textured, yet smooth surface, to which layers of coloured oil are applied to create deep lustred boards, each with a distinctive tone and grain variation. View the full Deco Collection and watch this space for our next competition.